NewSouth author and preeminent southern historian Paul Gaston has received high praise from those attending recent events in support of his new memoir Coming of Age in Utopia: The Odyssey of an Idea. Gaston was recently the guest of honor at the AFL-CIO where civil rights activist Julian Bond spoke and introduced him to a large and receptive crowd. Gaston discussed his new memoir, which highlights his life as a southern historian and social justice advocate during his time in Charlottesville as a professor of history at the University of Virginia. Gaston also recently spoke, along with another former student and SNCC historian Andrew Lewis, at an event hosted by the University of Richmond. Gaston and Lewis discussed their recently published books with a focus on the role sit-ins and nonviolent resistance played in the civil rights movement. Watch the entire University of Richmond program at C-Span’s Book TV. “I fear [the NCAA is] about to make a colossal mistake,” writes Boston Globe columnist Bob Ryan, “that I would attribute to not doing their homework.” Part of that homework, Ryan continues, is reading NewSouth Books’ Behind the Hedges: Big Money and Power Politics at the University of Georgia, which details the controversies over UGA President Michael Adams’ performance and financial decisions during his tenure at the university. Ryan suggests the NCAA should think twice before naming Adams as their own new president. In Behind the Hedges, the late Pulitzer Prize-winning journalist Rich Whitt focused his investigative lens on recent events at the University of Georgia, and in so doing examined the bigger story of “a sea change in how America supports its institutions of higher education.” Through interviews with many key figures in a struggle for power at UGA over the last decade, Rich examines the controversial tenure of Michael Adams as UGA president, and how this controversy led to the unprecedented split between the Board of Regents and the UGA Foundation, with implications for the landscape of higher education funding nationwide. 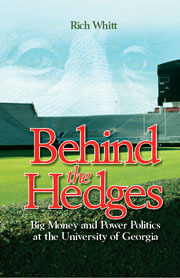 Behind the Hedges: Big Money and Power Politics at the University of Georgia is available from NewSouth Books, Amazon.com, or your favorite local or online book retailer. Anna Olswanger, author of Shlemiel Crooks, remembers fondly fellow Society of Children’s Book Writers & Illustrators member Sid Fleischman, who died of cancer on March 17, 2010, the day after his ninetieth birthday. Sid Fleischman, the Newbery Award-winning author of The Whipping Boy, was originally born in Brooklyn, New York, but he grew up in Sand Diego. A magician at heart, he traveled in vaudeville as a performing magician, but his live performances were transformed into the mysteries of writing. Fleischman attempted, at first, to write for adults, and then, he wrote some screenplays. Only when he began to write children’s books did he find literary success. He wrote over thirty-six books for children, including the McBroom series, By the Great Horn Spoon!, and Mr. Mysterious and Company. Olswanger: What are some of the intangible rewards of writing for you? Fleischman: There’s the satisfaction in knowing that your books have had an impact. You discover that from the letters you get. Kids tell you they have gotten pleasure from your books, or parents and teachers let you know that one of your books turned a resistant child on to reading. There’s also the reward of doing a good job. When you finish a novel, and you’ve solved the problems, that’s a tremendous satisfaction. And there’s the reward of the lifestyle that writing has given me. I have complete freedom, although we writers work ourselves much harder than people who have a boss. I work seven days a week, and I don’t know how many hours between doing all the things that go along with it — researching, writing, answering the mail. If I were working for a salary, I would want a raise! Olswanger: Which of your books are you the proudest of? Fleischman: The Whipping Boy is one. By the Great Horn Spoon!, a novel about the California Gold Rush, is a second. By the Great Horn Spoon! has been continuously in print for more than 40 years and sells a huge number of copies every year. It’s widely read in fourth grades in the West. That and The Whipping Boy, I suppose, will be my legacy. It’s not to say there aren’t others out there I’m happy with. I’ve had fun with the McBroom stories. I love Mr. Mysterious and Company — I can’t tell you the magicians I’ve met who were turned on to magic by that novel. And I think Scarebird is the best piece of work I’ve done. I wish I could do. It’s a picture book, one of those books you feel you wrote under special grace that doesn’t visit you often. I had all kinds of problems with it, but the finished book is as close to perfection as I will come. Fleischman left behind his son, Paul Fleischman, who is a writer and poet. Like father, like son: Paul received the Newbery Award for his book of poetry Joyful Noise: Poems for Two Voices in 1989. Fleischman received his award in 1987. As an amazing author and a talented magician, Fleischman’s love for these performing arts remains timeless and can be found in several of his published works as well as in the hearts and imaginations of many children. As noted on Media Bistro, NewSouth children’s author Anna Olswanger recently had her award-winning book Shlemiel Crooks included on a shortlist of “The Best Passover Books for Children” by Flashlight Worthy, a website devoted to handpicking book recommendations on hundreds of topics. Flavored heavily with a Yiddish inflected narration and illustrated with earthy, heavily outlined linocuts, this gem of a story requires considerable practice before reading aloud… but it’s worth the effort. Congratulations Anna on this noteworthy and timely selection. Shlemiel Crooks is available from NewSouth Books, Amazon.com, or your favorite local or online retailer. Robert Baldwin, author of Life and Death Matters: Seeking the Truth about Capital Punishment, published by NewSouth Books, continues his campaign against the death penalty with some high profile events. In February, he participated in the fourth World Congress to Abolish the Death Penalty in Geneva, Switzerland, where 1,700 people discussed ways to abolish capital punishment worldwide. Speakers included Iranian Nobel Prize laureate Shirin Ebadi and Sister Helen Prejean, author of Dead Man Walking. Dr. Baldwin made many new contacts and friends from all over the world. As a result of that meeting, he has been invited to be a speaker at an all-day rally supporting death penalty abolition at the United Nations Headquarters on April 30, sponsored by Voices for Death Row Inmates, a non-profit abolitionist organization based in England. At the London meeting, Dr. Baldwin will also introduce his first CD of contemporary Christian music, entitled, “Simply Jesus.” Proceeds from sale of the CD will benefit prison ministry and efforts to obtain a morartorium on the death penalty in Alabama. Life and Death Matters is available from NewSouth Books, Amazon.com, or your favorite retail or online bookseller. Dan Pollitt, professor emeritus at the University of North Carolina Law School and contributor to two volumes of political essays published by NewSouth Books, Where We Stand: Voices of Southern Dissent and American Crisis, Southern Solutions, died earlier this month; he was 88. Pollitt was a graduate of Wesleyan University and Cornell Law, and he served in World War II as a Marine Infantry Officer. He served on the Southern Regional Council, on the board of the American Association of University Professors, and on the national boards of the ACLU and Southerners for Economic Justice. He has litigated and published widely in the areas of labor law, civil liberties, and civil rights. He fought for integration in the 1950s, supported gay rights in newspaper editorials, and supported the abolition of the death penalty. In one of his last editorials, published in the News & Observer, Pollitt sympathized with soldiers fighting in Afghanistan after his own experiences in World War II. Some suggestions he made included stopping the drone bombings when innocent civilians might be killed; re-purposing rather than destroying poppy plants so as not to deprive the farmers of their livelihood; and bringing in more doctors and construction works to help heal and rebuild the country. Friends suggested that Pollitt’s progressive opinions here were suggestive of his character. Read the News & Observer obituary of Dan Pollitt. NewSouth Books expresses our condolences to Pollitt’s friends and family for their loss. [Enchanted Evening Barbie] traces the life of a busy girl and woman who, right out of Auburn, started a small newspaper in Georgia. She married a newspaper cartoonist, moved from here to there, got divorced, dated a man who killed himself in front of her, married for a second time to the man of her dreams and then found him dead at home, last March, four days after his heart surgery. Rheta still sounds tender when talking about her late husband, journalist Don Grierson, a UAB journalism professor … She’s having minor second thoughts about having published the memoir, but she hopes it will help someone in the way Didion’s book helped her. And, as always, Rheta couldn’t stop herself from writing it. As Florence-Lauderdale Library director Nancy Sanford told the Times-Daily, “Knowing how much women’s lives have changed in the last 25 to 30 years, and how our expectations change, I think that’s hit a chord, and I think [Enchanted Evening Barbie] is going to hit a chord for us.” NewSouth is proud to see that chord already beginning to resonate. Enchanted Evening Barbie and the Second Coming is available directly from NewSouth Books, Amazon.com, or your favorite local or online book retailer. NewSouth author Gerald Duff recently traveled to Columbia, South Carolina to discuss his collection of short stories Fire Ants and Other Stories at the fourteenth annual South Carolina Book Festival. Held at the Columbia Metropolitan Convention Center on February 27-28, Duff was one of many authors participating in the festival, appearing on two panels and participating in a “Brunch with the Authors” event. Read more about the festival at the Free Times. Duff’s next appearance is in April at the Wisconsin Book Festival where he’ll also read and comment upon Fire Ants. Fire Ants is available from NewSouth Books, Amazon.com, or your favorite local or online retailer. You are currently browsing the NewSouth Books weblog archives for March, 2010.